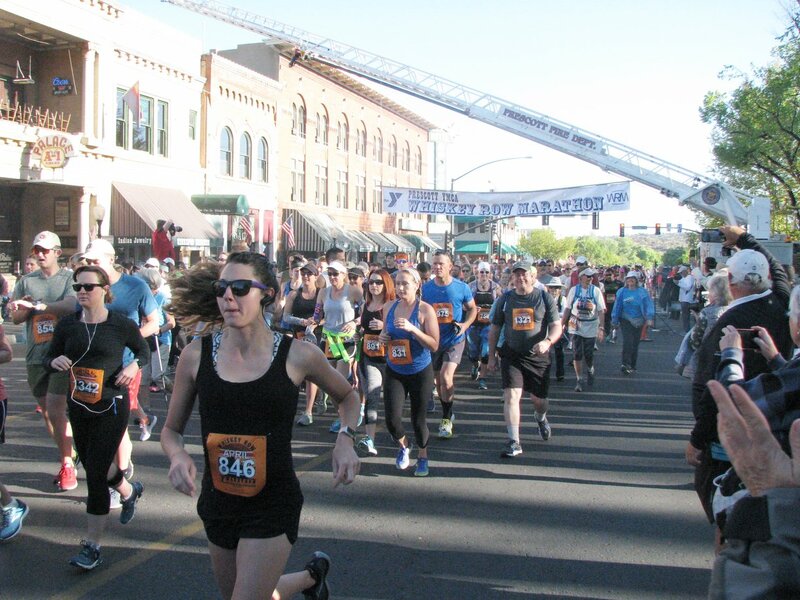 Get ready to run – or to enjoy the fun – during the James Family Prescott YMCA 41st Annual Whiskey Row Marathon on Saturday, May 4, 2019. Sponsored by Yavapai Regional Medical Center (YRMC), the race is the oldest continuously run marathon in Arizona and well-known for its fun Finish Line Expo. “Yavapai Regional Medical Center is delighted to serve as the Signature Sponsor of the Whiskey Row Marathon,” said Kenneth Boush, YRMC’s Director of Marketing and Communications. “The Marathon is a perfect fit for YRMC’s focus on health, wellness and fitness.” Want to Join the Whiskey Row Marathon Fun? You can register here for the Marathon or sign-up in person at the James Family Prescott YMCA, 750 Whipple Street in Prescott, with this registration form. “The Whiskey Row Marathon has a race for runners at all levels,” said Damon Olsen, Executive Director, James Family Prescott YMCA. “Marathoners love the challenge of our tough full marathon and half-marathon race courses. Other runners enjoy the 10K or the two-mile run or walk. We welcome all runners and applaud their dedication to health and fitness.” The Race-Day Schedule You’ll join fellow runners at the Whiskey Row Marathon starting line on May 4, at Prescott Courthouse Plaza on Montezuma Street between Gurley and Goodwin Streets. Here’s the schedule for the Whiskey Row Marathon: 5:00 am – Full Marathon, Early Start (26.2 miles) – The course winds through Prescott, up 3,000 feet along open, paved roads and then cuts through the Ponderosa pine-covered Prescott National Forest along dirt roads. (Early Start participants are not eligible for awards.) 6:00 am – Full Marathon, Normal Start (26.2 miles) 7:00 am – Half Marathon (13.1 miles) – The course starts on historic Whiskey Row, heads out to Aspen Creek on Copper Basin through the Ponderosa Pines of the Prescott National Forest and then finishes at the Prescott Courthouse Plaza. 7:20 am – 10K (6.2 miles) – A loop course through downtown Prescott and the surrounding area. 7:15 am – Two-mile Fun Run/Walk. Celebrate at the Finish Line Expo! All Whiskey Row Marathon participants and guests will enjoy the Finish Line Expo. Delicious refreshments, lots of free gifts, soothing massages, live music and more will continue the high energy for which the Whiskey Row Marathon is famous. The Whiskey Row Marathon attracts dedicated marathon runners from as far as Azerbijan, Poland and as close as Prescott. Runners from 30 states from around the country also participate in the Whiskey Row Marathon. Contact the YMCA for More Information To register, volunteer or for more information about the Whiskey Row Marathon, visit the official marathon website or contact Rachele Skvarek, Whiskey Row Marathon Race Director, by email or at (928) 445-7221, ext. 217. 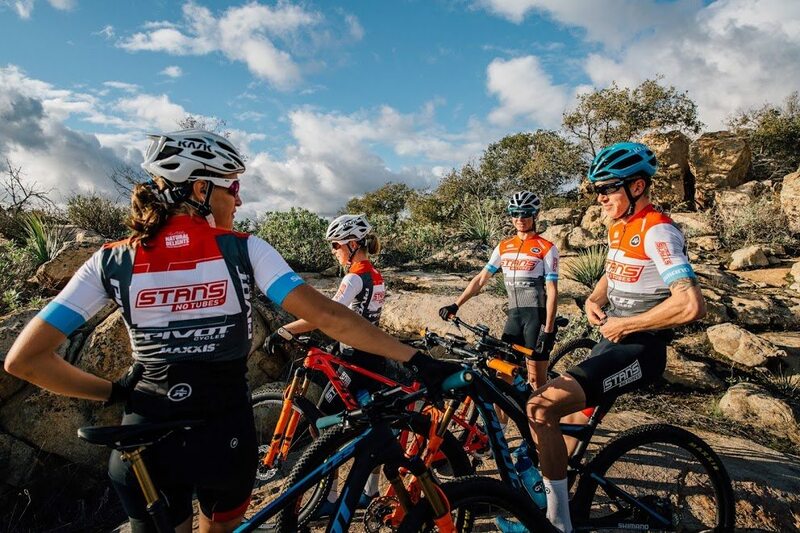 Rita Carey Rubin, host of YRMC’s Your Healthy Kitchen, recently caught up with Chloe Woodruff, professional competitive cyclist and founder / manager of the Stan’s-Pivot Pro Team, presented by Maxxis. Woodruff, a World Cup competitor, also happens to be a long-time Prescott resident. Woodruff shared some great tips on how professional athletes fuel up before, during and after the big race. Woodruff follows a ‘slow food’ approach to staying healthy. Her slow food approach means avoiding processed food or added sugar, and eating foods that take longer to digest for sustained energy. Woodruff’s mantra is, “Eat slow and race fast!” One of Woodruff’s go-to recipes the morning of a race is Bircher Muesli, an overnight oatmeal. Rolled oats are soaked overnight with yogurt and almond milk and flavored with dates and cinnamon. On training days, Woodruff may throw in a few extra nuts, grated apple and raisins. However on race days, she keeps the recipe lighter and less dense. On a race day, however, she often slices a banana into the muesli right before eating. For sweetening, Woodruff uses sliced Natural Delights Medjool dates or a date paste, which Rita describes in the video as she prepares the muesli. In separate videos, Rita demonstrates recommended recipes for a simple meal the night before a race as well as a post-race recovery smoothie. 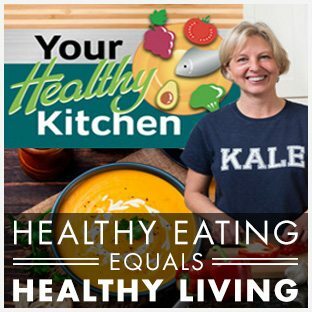 Visit yrmchealthconnect.org regularly for these and many additional video demonstrations, tips and recipes from YRMC’s Your Healthy Kitchen. For the second year, Yavapai Regional Medical Center will sponsor the Whiskey Off-Road Kids’ Fun Ride on Sunday, April 28th as well as a bike-decorating event for kids on Saturday, April 27th. Visit Epic Rides for more information and to register. YRMC will cover the cost of all children who participate in the Kids’ Fun Ride and will donate the proceeds to Prevent Child Abuse Arizona. The goal is to allow as many kids as possible to participate free of charge, giving back to the community that has given so much to YRMC over the years. Parents and guardians are welcome to accompany their kids on the Kids Fun Ride. Helmets are required by all. 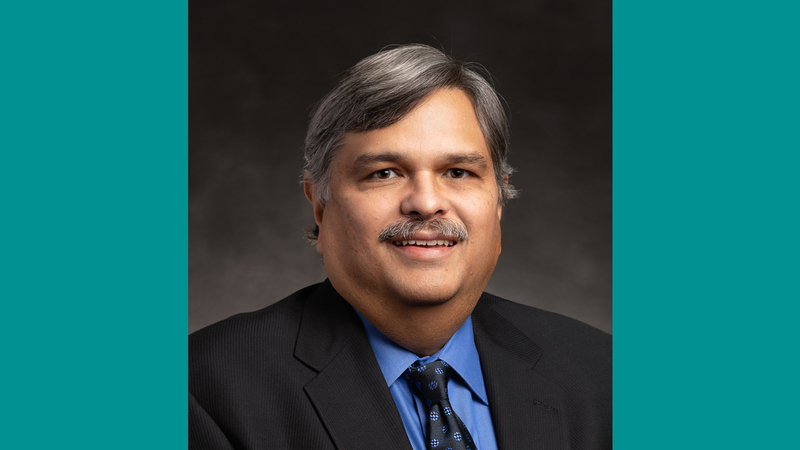 Yavapai Regional Medical Center PhysicianCare is pleased to welcome Robert Candipan, PhD, MD, Interventional Cardiologist, to its cardiology team on Ainsworth Drive in Prescott. Dr. Candipan has completed an Interventional Cardiology Fellowship at Sequoia Hospital in Redwood City, California and a Postdoctoral Research Fellowship in Cardiovascular Medicine at Stanford University School of Medicine, Stanford, California. He is Board Certified in Interventional Cardiology, Cardiovascular Disease and is a Diplomate with the National Board of Medical Examiners. Dr. Candipan is currently accepting new patients. Please speak to your family doctor or call (928) 771-5256 to schedule your appointment. YRMC PhysicianCare is pleased to accept most insurance plans including Medicare and is located at 811 Ainsworth Drive, Suite 106, in Prescott. To learn more, call (928) 771-5256 or visit www.yrmcpc.org. 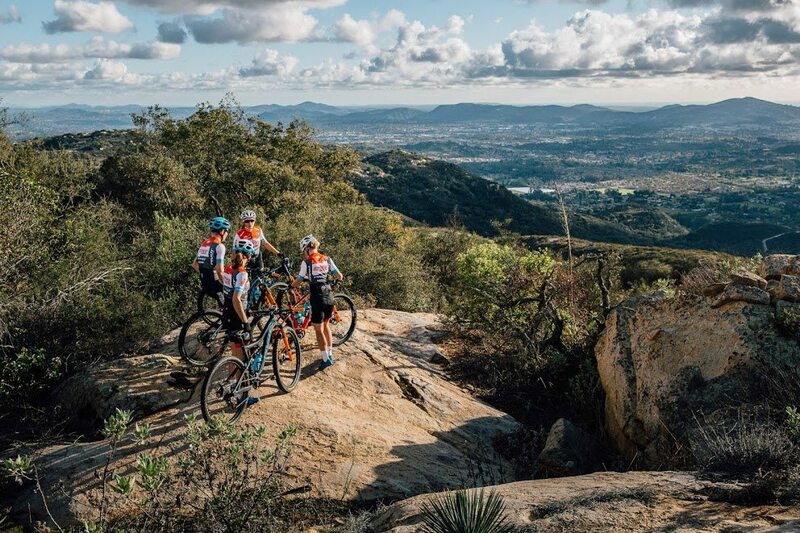 Rita Carey Rubin, host of YRMC’s Your Healthy Kitchen, recently caught up with Chloe Woodruff, professional competitive cyclist and founder / manager of the Stan’s-Pivot Pro Team, presented by Maxxis. Woodruff, a World Cup competitor, also happens to be a long-time Prescott resident. Woodruff shared some great tips on how professional athletes fuel up before, during and after the big race. She says the best nutritional advice she can give is to keep it simple and whole and avoid processed foods and sugar. “Whenever possible, our team rents places on the road with a kitchen so we can prepare our own healthy meals,” she adds. On the evening before the race, Woodruff opts for a simple meal that includes a protein like chicken, some starch like pasta or potato and some cooked greens. She avoids carb loading or ‘stuffing oneself’ before the ride. In this video, Rita prepares baby arugula, chard and kale along with roasted chicken and fingerling potatoes, topped with carrot top pesto and pan roasted cherry tomatoes for an ideal dinner before the big day. In upcoming videos, Rita demonstrates recommended recipes for breakfast the morning of the race as well as a post-race recovery smoothie. Visit yrmchealthconnect.org regularly for these and many additional video demonstrations, tips and recipes from YRMC’s Your Healthy Kitchen. For the second year, Yavapai Regional Medical Center will sponsor the Whiskey Off-Road Kids’ Fun Ride on Sunday, April 28th as well as a bike-decorating event for kids on Saturday April 27th. Visit Epic Rides for more information and to register. YRMC will cover the cost of all children who participate in the Kids Ride and will donate the proceeds to Prevent Child Abuse Arizona. The goal is to allow as many kids as possible to participate free of charge, giving back to the community that has given so much to YRMC over the years. Parents and guardians are welcome to accompany their kids on the Fun Ride. Helmets are required for all. Lisa and Wellby the Yavabear after a Whiskey Row Marathon race. Lisa Miller, BSN, RN, was 19-years-old when she ran her first Whiskey Row Marathon. The Chicago native – who was All-State in track and field during high school – was attending Northern Arizona University (NAU) at the time. “I didn’t know a soul in Flagstaff,” she said. “I met some fellow runners and started training with them. It took about six months to adjust to the elevation. But then, I started doing tons of 10Ks and half-marathons.” Among those first races was the Whiskey Row Marathon. While Lisa has lost count of how many times she has run the Marathon, the race is definitely a favorite. “The Whiskey Row Marathon is so great because it has such a sense of community,” said Lisa, Employee Health and Wellness Nurse, Yavapai Regional Medical Center (YRMC). Lisa Loves the Whiskey Row Marathon Lisa is looking forward to running the Marathon’s 10K on Saturday, May 4. The 41st Annual Whiskey Row Marathon is especially important to her because YRMC is the Signature Sponsor. “I’m expecting to see lots of familiar faces running the race and volunteering along the course,” she said. “The Marathon starts and finishes at the Courthouse. There’s music and that’s where they give the awards. It’s just a great celebration.” Let’s Ask Lisa! Lisa has become an informal advisor to many YRMC employees who are preparing for Whiskey Row Marathon races. Her credentials are impressive. Lisa qualified for the Boston Marathon in 2002 and has run 10Ks, half-marathons and marathons throughout her adult life. With all of her success as a runner, Lisa has kept only two medals. “Running is not about the finish line. It’s about the day-to-day work you do to reach the destination,” she explained. “When I get a medal, I give it away to the first kid I meet after the race.” What questions does Lisa typically receive about preparing for a 10K, half marathon or a marathon? Here are Lisa’s responses to her FAQs: Q: How much running should you do to be ready for a race? A: It’s important to build a base when you’re preparing for a race. For me, that’s running about 20 to 25 miles a week. Once I have my base, I plan for a long run once a week. I’ll get up to about 10 miles for a 10K, even though a 10K is 6.2 miles. I also do hill training and hill repeats. Q: What can I do to get faster for the race? A: I like to run fast so the last four weeks before a race, I do speed workouts on the track—400s and 200s. It’s like a warm up and a cool down in between to build up my speed. Q: Should I follow a special diet when I’m training for a race? A: I make sure I’m always hydrated and I eat right. Since I’m a vegetarian, the main thing for me is to make sure I have enough complex carbohydrates and calories before a race. Of course, I eat fruits and vegetables. Q: I’m a new runner. What’s the most important thing I need to do? A: Invest in a good pair of running shoes twice a year. Your shoes are really, really crucial. And when you’re new to running, I recommend you buy your shoes at a running store. They will be able to match your running motion – pronation or supination – to the best shoe for you. Take to Trails Lisa also recommends running on the great trails around Prescott and Prescott Valley as a way to connect with nature. She also likes to run with a friend, which she will be doing with all of her YRMC colleagues on May 4. “I am so proud that YRMC is sponsoring the Whiskey Row Marathon,” Lisa said. “People come from all over to run the Marathon. You get bragging rights because it’s an uphill course.” There’s a run (or walk) to fit nearly every fitness level at the Whiskey Row Marathon. To register, volunteer or for more information about the Whiskey Row Marathon: Visit the official Whiskey Row Marathon website. Find the Whiskey Row Marathon on Facebook and Instagram. Contact Rachele Skvarek, Whiskey Row Marathon Race Director at (928) 445-7221, ext. 217. Have you wondered how scientific research affects real lives? Look no further than the Human Genome Project for a shining example of how research leapt – relatively speaking – from research labs to patient clinics, like Yavapai Regional Medical Center’s (YRMC’s) Genetic Clinic in Prescott Valley. In 2003, scientists from 20 research institutions in six countries, including the United States, announced they had completed the monumental achievement of sequencing the entire human genome. How did this information make it into our everyday healthcare world? Jody Pelusi, PhD, FNP, AOCP, Oncology Nurse Practitioner, who oversees cancer genetic testing at YRMC’s Genetic Clinic recalls, for example, that breast cancer genetic testing used to involve only two genetic mutations: BRCA1 and BRCA2. “Now we know many genes exist,” said Dr. Pelusi. “Therefore, we do panel testing to look at anywhere from 30 to more than 100 genes.” What can genetic testing at YRMC’s Genetic Clinic accomplish? The answer to that question depends on the patient’s individual needs. Genetic testing is typically pursued to: Pinpoint actual risk for developing cancer from a hereditary mutation versus a perception of cancer risk. Learn cancer risk based on personal or family risk factors for people found not to be at high risk for cancer based on genetic testing. Determine the best treatment options, follow-up care and long-term monitoring for people diagnosed with cancer. Learning Your Genetic Risk for Cancer Before genetic testing happens – typically starting with a swab of salvia from the mouth – Dr. Pelusi meets with the individual to discuss his or her goals. Her approach is part scientist, part counselor and all supportive. “We talk about genetic testing, the information they will potentially learn and if knowing that will make a difference in how they approach their healthcare,” explained Dr. Pelusi. “Some people may come from families who didn’t discuss illness or they may be adopted and have no knowledge of their genetic history. There are many different circumstances.” During a first appointment, Dr. Pelusi introduces cancer genetic testing by: Reviewing the goals of cancer genetic testing. Discussing why the person is interested in genetic testing. Developing a profile based on the family’s history of cancer, including the type of cancer and at what age the family member was diagnosed with cancer. Outlining the pros and cons of genetic testing, including how test results can affect the people being tested as well as their family members. “About 10 percent of people will actually be found to have a genetic change that puts them at higher risk for potentially developing a cancer,” Dr. Pelusi said. “However, this 10 percent is significant as this can be life changing. Some individuals will come in and get the information and want to think about it before they determine if they want to undergo testing or not; this is absolutely fine.” Your Genetic Test Results For people whose genetic test results show they’re at higher risk for cancer, Dr. Pelusi works with their clinicians to provide valuable information on healthcare and lifestyle options. This may include increased health monitoring and screenings, lifestyle changes, risk-reducing surgeries and chemoprevention (using drugs, vitamins or other agents to reduce cancer risk, delay its development or help prevent recurrence). “These are emotional topics,” Dr. Pelusi said. “This is not a time to fear cancer. But we sure can fight it with our awareness, our knowledge and our actions. I make sure people have the information they need to make a decision they’re comfortable with. I listen and respect their approach. You can’t get that in a mail order test.” To schedule an appointment at the Genetic Clinic for a genetic evaluation and possible testing, call (928) 442-8747. The Family Resource Center at Yavapai Regional Medical Center (YRMC) has once again partnered with the Governor’s Office of Highway Safety to offer a free car seat safety program to families in Yavapai County. In 2019, the Family Resource Center marks its 30th anniversary of serving families in the Quad Cities area. Via the Family Resource Center’s Healthy Families program, parents and children are offered free home visits from highly trained early childhood specialists. This program supports healthy pregnancies, bonding and attachment, and ways to promote healthy brain development to create the foundation for emotional regulation and a child’s ability to respond to everything in life as they enter into adulthood. Healthy Families also provides developmental screenings and connections to community resources, individualized for each family. The renewed grant from the Governor’s Office of Highway Safety will allow the Family Resource Center team to: Provide car seat safety checks Distribute free car seats when needed Offer education to help keep children safe inside their family’s vehicles In 2018, more than 90 percent of seats checked via this program arrived in an unsafe configuration, greatly increasing the child’s risk of injury or death in the event of a car accident. Recipients need a vehicle with working seat belts and will receive 30 minutes of child safety seat education, typically scheduled on an individual basis. The education and safety checks are provided by nationally certified Child Passenger Safety technicians. 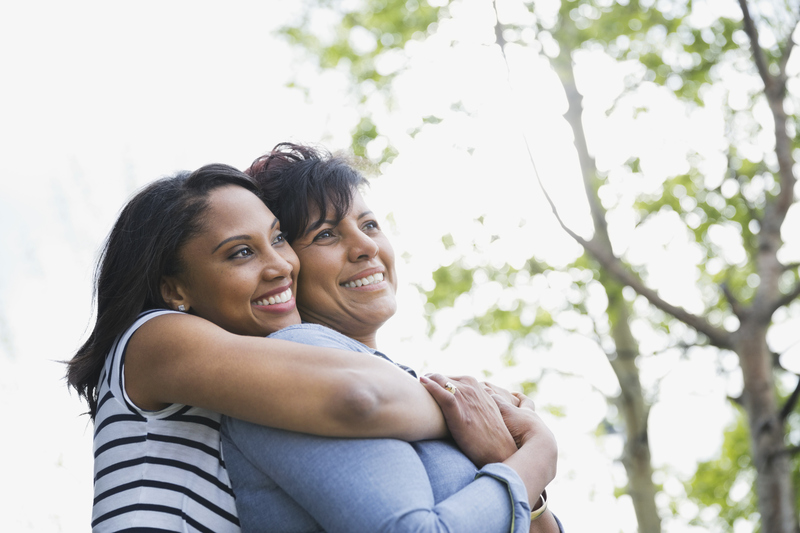 Keeping your child safe is one of the most important jobs that caregivers have. YRMC’s Family Resource Center and the Governor’s Office of Highway Safety have made it easier for many of our families in the Quad Cities area to do just that. For more information, please call YRMC’s Family Resource Center at (928) 771-5651. 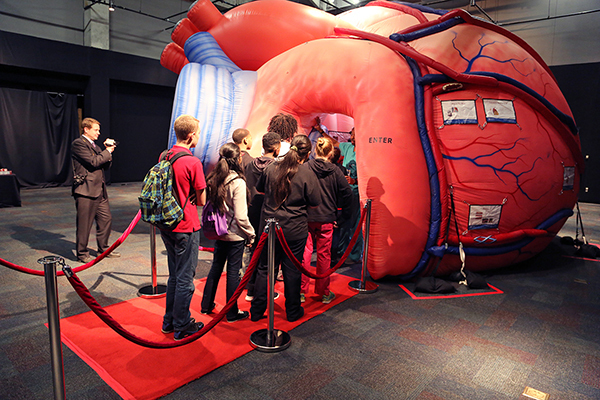 That means you, your family and your friends can explore the world’s only larger-than-life, walk-through exhibits of the human body: MEGA Body™ and MEGA Heart™. Science and history intersected during Patient Blood Management: Yesterday, Today and Tomorrow, Yavapai Regional Medical Center’s (YRMC’s) 6th Annual Patient Blood Management (PBM) Symposium. Approximately 350 people – PBM advocates from across the southwest, physicians, nurses, college students and more – gathered for the 2018 PBM Symposium at Yavapai College Performing Arts Center in Prescott. Throughout the world, even more streamed the Symposium live on laptops, smart phones and other devices. “It was the best of both worlds,” said Dale Black, Patient Blood Management Program Coordinator at YRMC. “Our guests enjoyed a pre-Symposium reception that included an array of appetizers, lots of friendly conversation and information from our industry partners who support YRMC’s vision for Patient Blood Management.” Industry leaders who joined YRMC at the PBM Symposium include: Instrumentation Laboratory Daiichi Sankyo, Inc. Haemonetics Baxter “During the Symposium,” said Black, “we welcomed guests from throughout the globe who live-streamed the event. All Symposium participants took away new information about the value of PBM and the leadership role YRMC plays in PBM.” If you missed the Symposium, we’ve collected some highlights to get you up to speed on PBM’s science, history and future. ﻿ #1 Patient Blood Management wasn’t built in a day. The 6th Annual PBM Symposium coincided with YRMC’s 75th anniversary, a perfect opportunity to highlight the history of PBM, courtesy of Pierre Tibi, MD, FACS, Cardiothoracic Surgeon and Medical Director of the James Family Heart Center at YRMC West. Dr. Tibi said the idea of transfusing blood goes back to 1556, but the first actual human-to-human “blood transfer” happened in 1818. Fast forward to the early 1900s for another milestone: the identification of human blood types—A, B, AB and O. Soon after, a test that allowed physicians to ensure blood compatibility before transfusing patients was introduced. Another big breakthrough coincided with World War II as researchers discovered how to break down blood into components and products. Plasma – a blood product – saved the lives of many wounded soldiers during the war. #2 Blood is one tough tissue. Daniel Beck, MD, Anesthesiologist at Prescott Anesthesia, emphasized that blood – a connective tissue – actually functions like a complex, multifaceted organ. Comprised of water, electrolytes, small molecules, proteins and cells, blood performs many significant roles in the body. For example, Dr. Beck highlighted the important job performed by one of our two types of white blood cells. “These white blood cells repair all types of tissue damage,” said Dr. Beck. “The repairs range from paper cuts to broken bones and all of the way to heart attacks.” #3 When it comes to the safety of our blood supply the expression, “we don’t know, what we don’t know,” applies. Medical experts in the United States agree that our blood supply is the safest it has ever been when it comes to disease transmission. “The concern is always about unknown infectious diseases,” said Elizabeth Black, Data Manager and Administrative Assistant, YRMC’s PBM Program. “Current blood testing measures are only going to test for infectious diseases we know about. You can’t test for something if you don’t know it exists.” #4 Storing your own blood for surgery comes with some potential complications. Storing your blood for use during and after surgery sounds like an ideal way to prevent the transfusion of a virus. However, autologous blood donation – as it’s called – may lead to anemia, which can slow recovery. “Even your own blood is stored blood,” said Elizabeth Black. “It is not the same quality as the fresh blood moving through our bodies or the blood that’s taken immediately before surgery.” #5 Physicians and PBM experts know: If you don’t use it, you won’t lose it. YRMC’s thriving Structural Heart Program demonstrates how medicine is integrating PBM into its less invasive procedures. Soundos Moualla, MD, FACC, FSCAI, Interventional Cardiologist at the James Family Heart Center at YRMC West, uses less-invasive procedures and advanced technologies to help people previously considered too high-risk for surgery. These procedures require small skin punctures, rather than major incisions. “These new technologies allow us to safely perform minimally invasive procedures,” said Dr. Moualla. “The procedures do not require blood use and typically there is no blood loss.” #6 New procedures at YRMC’s Heart Center support PBM principles. In the 1980s, cardiology took its first steps in this direction with the introduction of cardiac stenting, which allowed some patients to forego open heart surgery. Today, many heart procedures are minimally invasive, including these which are available at the James Family Heart Center at YRMC West. Left Atrial Appendage Closure (WATCHMAN) Mitral Valve Repair with MitraClip Paravalvular Leak Closure (PVL) Transcatheter Aortic Valve Replacement (TAVR) #7 Your YRMC providers are your PBM partners. PBM is at its best when there is strong communication between nurses, patients, family members and other patient advocates. This is standard operating procedure at YRMC. “We’ll literally report at your bedside to involve you and your family,” said YRMC’s Selina Bliss, MS, PhD, RN. “This allows us to clearly communicate a care plan for your anemia.” YRMC’s multi-disciplinary team – advanced clinical practitioners, dietitians, medical laboratory professionals, nurses, pharmacists, physical therapists, physicians and more – also share their best practices for preventing patient anemia during “Lunch and Learn” programs. Recently, YRMC’s Emergency Department team outlined how early admission of a medication to treat excessive blood loss has helped patients experiencing traumatic bleeding. The ICU staff shared a successful strategy to monitor hemoglobin counts – a low count may indicate anemia – as a way of reducing the frequency of patient blood draws, which can lead to anemia. #8 Researchers are applying leading-edge science to the study of blood. Creating a blood substitute…developing a universal blood type…transforming human stem cells into units of blood…all of these and more are under research today. “Scientists are looking for the optimal artificial human blood that can carry oxygen to our tissues without any of the biological baggage associated with a unit of blood,” explained Jared Head, AGACNP-BC, Hospitalist, NAZ Hospitalist. #9 PBM’s future is now. During the PBM Symposium, Dale Black, PBM Program Coordinator, spoke with Tucson resident Anthony Caballero about the extensive heart procedures he underwent at YRMC’s Heart Center, all using PBM principles. Even as researchers race toward an array of alternatives to blood transfusions, most medical experts point to PBM as the most effective way to safely care for patients. “What we are doing now may well be the future,” stated Head. “Keeping blood inside of the body and minimizing the number of blood draws to harness anemia—these and other PBM strategies may be the future of transfusion medicine.” #10 PBM is making a difference at YRMC today. YRMC has experienced an impressive reduction in the use of blood products, thanks to its hospital-wide PBM Program. “YRMC launched its PBM Program in 2012,” said Diane Drexler, RN, BSN, MBA, FACHE, Chief Nursing Officer at YRMC. “Since then, our use of red blood cells and fresh frozen plasma has declined by 32 percent and 61 percent, respectively.” Why is this decline good news for YRMC’s patients? It means YRMC’s surgeons and other physicians are minimizing patients’ blood loss and reducing unnecessary transfusions. And, as studies have shown, both of these PBM strategies can improve patient outcomes and speed recovery. For more information about YRMC’s Patient Blood Management Program, visit us here. Yavapai Regional Medical Center (YRMC) is recognized worldwide as a pioneer in Patient Blood Management (PBM). The public has the opportunity to learn from these PBM pioneers by watching Patient Blood Management: Yesterday, Today and Tomorrow, YRMC’s sixth PBM Symposium. The Symposium will be broadcast live via the Internet for the public to watch from the comfort of their homes. Log-in to learn about the science and history behind PBM on: Date: Thursday, October 25, 2018 Time: 6:00 to 8:00 p.m., Mountain Standard Time Log-In Options: YRMCHealthConnect.org/pbm or Facebook.com/YavapaiRegionalMedicalCenter What is PBM? What does PBM mean to you as a patient? It minimizes blood loss, reduces unnecessary transfusions and improves patient outcomes when medical teams embrace evidence-based medical and surgical concepts guided by the principles of PBM. Watch YRMC Patient Blood Management Services on YouTube. YRMC’s PBM Symposium will include an expert panel and short videos that highlight significant PBM experiences among Symposium participants. PBM Symposium Experts: Informative & Interesting Additionally, these Prescott, Arizona PBM experts will give thought-provoking, informative talks on: The Wonder of Blood Daniel Beck, MD, Anesthesiologist, Prescott Anesthesia The History of Transfusion Medicine Pierre Tibi, MD, FACS, Medical Director, Patient Blood Management and the James Family Heart Center at YRMC West Transfusion Medicine, Where We are Today Elizabeth Black, Data Manager/Assistant Coordinator, Patient Blood Management Program, YRMC Transfusion Medicine, What the Future Holds Jared Head, AGACNP-BC, Hospitalist, NAZ Hospitalists Heart Surgery Without “Surgery” Soundos Moualla, MD, Cardiologist, YRMC PhysicianCare Nurses: Creating an Environment in Which Patients Thrive Selina Bliss, MS, PhD, RN, YRMC Out-of-Town, But Not Out-of-Time Dale Black, Patient Blood Management Program Coordinator, YRMC For more information about Patient Blood Management: Yesterday, Today and Tomorrow, visit YRMCHealthConnect.org/pbm. If you have ever had the privilege of hearing Jennifer Harvey sing with her Femme-Folk Pop-Rock band, The Gurley Girls, you will know instantly that this busy lady’s got skills. She is a wife, mom, daughter, sister, aunt, cousin, niece, friend and cake pop baker in addition to her role as the Patient Navigator for the Lung Cancer Screening and Care program at Yavapai Regional Medical Center (YRMC). Her title is a mouthful and so is her job! YRMC started the Lung Cancer Screening and Care program in response to a national push to provide annual low dose CT scanning as a screening method for detecting lung cancer early. This program started as a result of a large-scale study known as the National Lung Screening Trial, which was sponsored by the National Cancer Institute (NCI) and conducted by the American College of Radiology (ACR). This study showed that “for the first time, we have a modality that’s proven by research to catch lung cancer early and it is effective and can save lives,” explained Jennifer. Early detection of lung cancer can increase the five-year survival rate. Jennifer added, “YRMC started this program to support our community because we have a high volume of smokers and we know that when people wait until they have symptoms of lung cancer, they are not likely to survive their diagnosis.” Jennifer’s role in the process is to help identify high risk groups and to inform practitioners as well as people in the community that this service is available; to act as a liaison between providers and specialists such as pulmonologists, radiologists, oncologists and surgeons; to connect patients to the screening program and treatments they may need after the screening; and to create educational materials and classes to help patients become healthier. “So, I act as a hub in this busy wheel,” said Jennifer. The day before a patient arrives for the first appointment, Jennifer calls them and explains how “the program is not a one and done type of thing. You come back annually for screening.” When they initially arrive at the clinic, Jennifer goes through a patient information folder she creates and develops a personal relationship with the patients. She wants them “to feel fully supported, to put a face with a name, and to really help them through the process.” There are some additional benefits of entering the program such as “smokers who enter the program often decide to quit smoking after realizing what smoking does to them,” Jennifer states. Another benefit of this program is that incidental findings may also be detected because of the screening. If someone has coronary artery disease, the calcifications can be spotted through CT screening and the patient can be referred to a cardiologist so that a heart attack may be prevented. A thyroid nodule may be discovered or another type of medical concern might also be noticed. “They might get help for something they didn’t even know they had,” explains Jennifer. If you think that lung cancer screening is something you should consider, please speak to your primary care physician or contact Jennifer at (928) 771-5454.